UPDATED: February 17, 2018 at 4:07 p.m.
A recent spike in conservative speakers invited to the Harvard Kennedy School has left students divided over the issue—some say the speakers are needed to foster a more complete discussion, while others question invited individuals' morals. In recent months, Elmendorf invited several conservative speakers to the Kennedy School, including fall Institute of Politics fellows Congressman Jason E. Chaffetz and Mark Strand. Students have criticized some of the invitations, most notably the Sept. 2017 visit of United States Secretary of Education Betsy DeVos and visiting fellowships offered to former Trump Administration officials Sean Spicer and Corey Lewandowski. “I do think about how to present a full range of views at the Kennedy School and make sure that people who don’t agree are talking about those disagreements and not just ducking each other,” Elemedorf said. 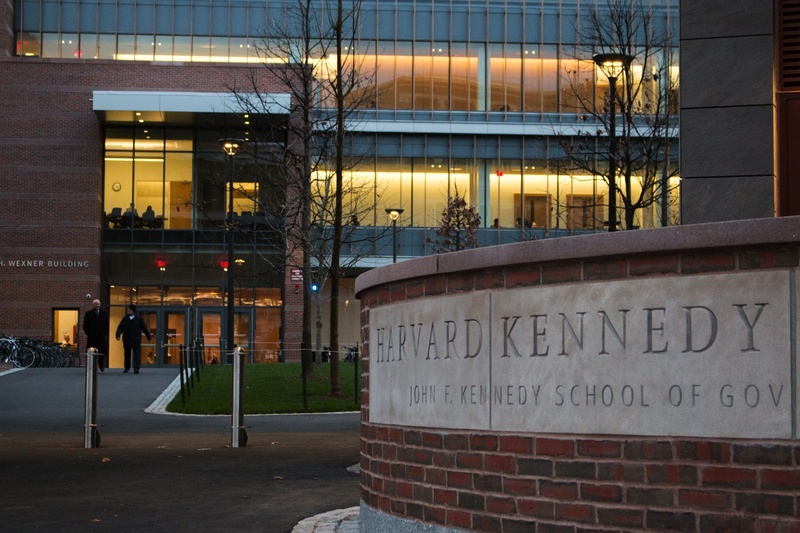 Professor David R. Gergen said the dean’s push to include conservatives at the Kennedy School is not a new initiative. Gergen said when he first arrived at the school in the late 1990s, former Dean Joseph S. Nye approached him about including more conservatives in the Institute of Politics fellows program. “Doug is not the first, but I do admire the fact that he is serious about it,” Gergen said. William H. Tobey, a senior fellow at the Belfer Center for Science and International Affairs and a self-identified conservative, said that, though conservatives are a “minority” at the Kennedy School, he values the discussions about ideological differences. He co-teaches a course with former Clinton Administration official Matthew Bunn on nuclear proliferation and nuclear terrorism. John D. Krohn, a master’s student who described himself as a moderate Republican, said that—while he thinks the administration is fostering an environment in which conservatives are welcome—he often does not see the same type of “appreciation” from his classmates. Krohn said he was disappointed with his peers’ criticisms of the Kennedy School's recent selection of Ohio Governor John R. Kasich as this year’s graduation speaker. “It’s sad from my perspective that here we have a man who’s championing public service for really his entire adult life, and because we live in a time where partisan gridlock is palpable and real, that people are reflexively responding to this man’s political party without fully understanding the public service that he has provided to his country,” Krohn said. “I think that’s emblactic of some of the things I see in my daily interactions at the Kennedy School,” he added. Though there is support for dialogue across the aisle, some students said they are worried some are conflating protesting conservatives with protesting those who have made poor moral choices. Jeff Rousset, a master’s student who participated in the DeVos protest, said the Kennedy School must keep a “moral compass” when choosing speakers. “In the fall, when I joined other HKS students in challenging some of the conservative speakers who were invited to speak, it wasn’t because they were conservative, it was because they were complicit in what many of us saw as really unethical behaviors and sometimes even illegal behaviors,” Rousset said. He cited accusations that Lewandowski had assaulted a female reporter and allegations that Spicer had lied to the public during his time as press secretary. Amidst this type of debate, Elmendorf said universities must be a place open to dialogue. “Universities are, at their core, places to develop and transmit knowledge and that knowledge can be unpleasant or inconvenient,” Elmendorf said. What's Right in the Ec Department?